Nice surprise. Found the May/June issue of SkyNews at my door. 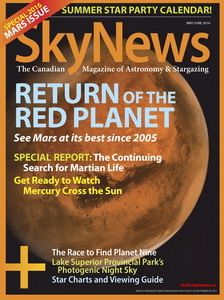 Cover shows Mars. Yes, indeed, Mars is back. This will be the best opposition since 2005. Good timing too. I am starting to aggregate data for my delivery of The Sky This Month on April 27... As I briefly skimmed, the editorial caught my eye. Looks like there is a changing of the guard. That's a big deal: Dickinson has been at the helm for a long time. And, of course, there's material on the transit of Mercury.